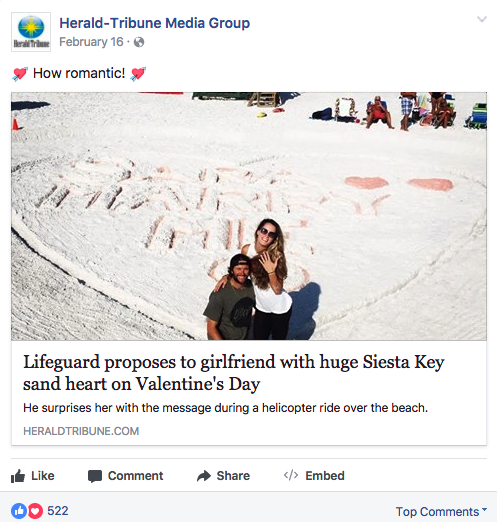 On his first day as a CrowdTangle user, the Sarasota Herald Tribune’s lead producer for analytics and engagement, Alan Shaw, sourced a local story that generated 30,000+ page views for HeraldTribune.com. It also overperformed by 28x what the average post does for the newspaper’s Facebook page. The success came by following two CrowdTangle best practices. The first thing Alan and his team did was set up a local list for first responders Facebook pages. This list included emergency services, police, and fire departments that are based in the Sarasota area. Second, Alan linked a CrowdTangle viral alert to that first responders list. Alan said he decided to edit the viral alert threshold from 10x down to 5x. Within 10 minutes of being posted, he received a notification that a Sarasota County Emergency Services Facebook post was gaining traction. 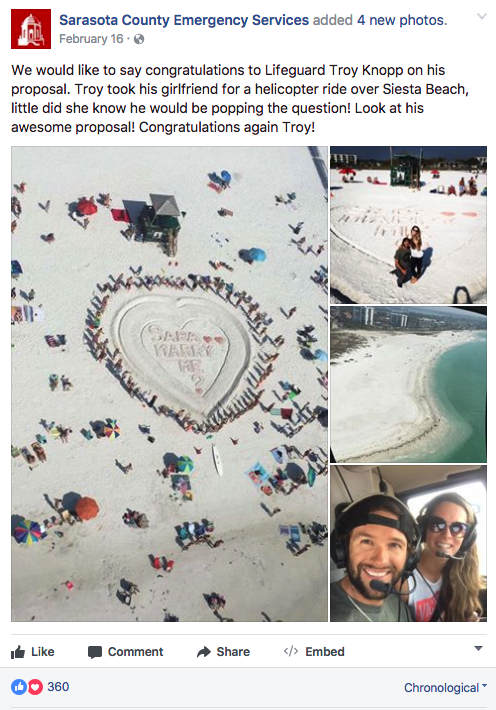 The emergency services post congratulated a Sarasota County lifeguard who surprised his girlfriend with a proposal during a helicopter ride over Siesta Key Beach. When Alan received the CrowdTangle viral alert in his inbox, he knew it was a story and called the local public information officer (PIO)to get more details. Alan says he posted an early version with the PIO’s comments to the Sarasota Herald Tribune’s Facebook page and within minutes the post was overperforming with their audience. The PIO also put Alan in contact with the lifeguard and his fiancé for an interview. Once he had the interview, Shaw says he updated the original story with the additional details and commented on the Facebook post, telling readers the story had additional quotes and photos of the couple. “Instead of doing another Facebook post, I jumped on the first post that was already overperforming to let people know we’d added more depth to the story,” he says. Alan says the story helped give the Herald Tribune a boost in traffic over the next few days. The story generated 30k page views, with 56% from social and Facebook as the lead referrer. The story overperformed by 28x what the average link post does for the Herald Tribune Facebook page, according to CrowdTangle. Alan is also using CrowdTangle’s underperforming features to see what’s not working on the Herald Tribune’s Facebook page. He says that by using this strategy, he found that wire stories were not performing as well as others on their page. This helped him realize that they should stay focused on posting local stories.